The Leica Depthmaster reception area is 200°. The intensity of the LED cluster of indicator lights can be seen even on the brightest of days and indicates the on-grade position relative to the plane of laser light. With its patented internal verticality control system, grade control will be more accurate as verticality is a prerequisite for precise measurements. Mounts either to a standard excavator or backhoe – even leveling work can be done with the same sensor. 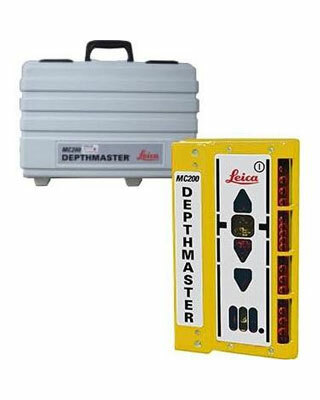 Different mounting systems (magnetic or brackets) allow the Leica Basic Digging System to be mounted on either side of the excavator arm. It is simple to use and achieves best results from the first day of use. The system is economical, saving time and material. Includes an energy preservation function which is deactivated with the "Shake-2-Wake" feature – reactivate the Depthmaster by shaking the excavator arm.